Beyoncé’s right-hand man DJ Swivel has reinvented himself as a mix engineer — and his work with the Chainsmokers produced 2016’s biggest track. 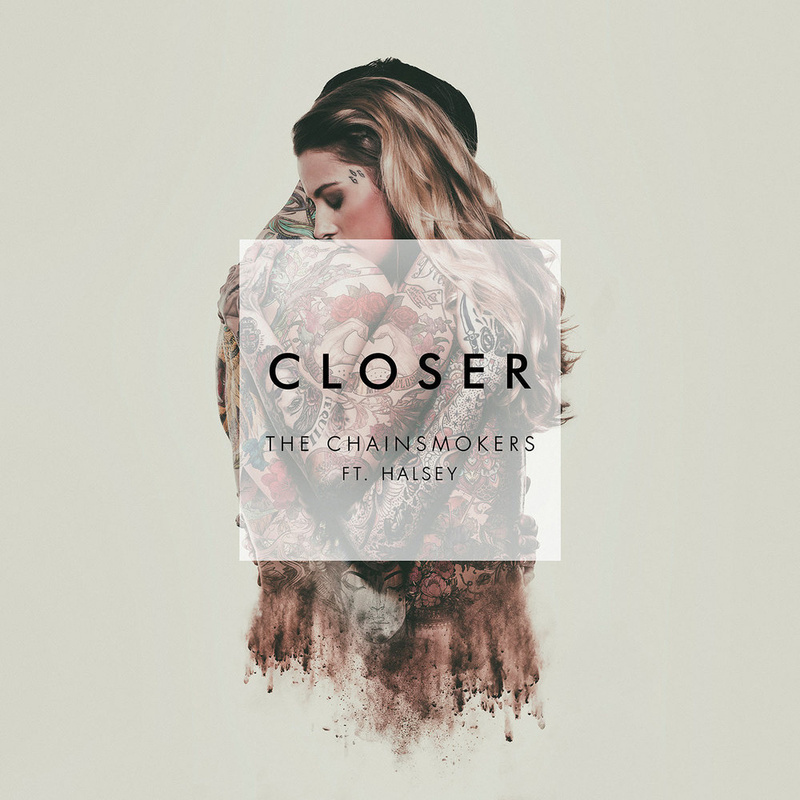 At the time of writing, the Chainsmokers’ ‘Closer’ is set to become the biggest single of 2016. It has enjoyed 12 weeks atop the US singles chart, four weeks at number one in the UK, chart-topping positions in 20-odd other countries, and worldwide sales of four million and counting. The song is just the latest episode in a meteoric rise to the top by the DJ duo, which began in 2014 with the instrumental/spoken-word electro-house track ‘#Selfie’ and continued with the 2015 hit ‘Roses’ (featuring Rozes), and 2016’s ‘Don’t Let Me Down’ (featuring Daya), all worldwide hits. 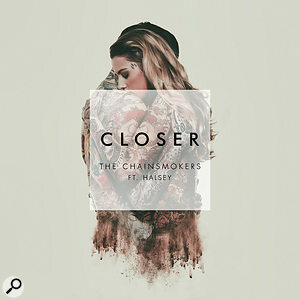 Like these last two, ‘Closer’ features an unknown guest singer — in this case Halsey — but it also introduces Andrew Taggart, one half of the Chainsmokers, as a lead singer. DJ Swivel.Photo: Cory VanderploegArguably the main behind-the-scenes contributor to the Chainsmokers’ hit factory is Jordan Young, aka DJ Swivel, who records the guest vocalists and mixes virtually all the duo’s output. Swivel’s name may be familiar to keen readers with good memories, as he first made his appearance in this periodical in October 2011, in an article that detailed his work as Beyoncé’s personal recording engineer and occasional mixer (www.soundonsound.com/people/dj-swivel-recording-beyonces-4). Originally from Toronto, the young Young went to Full Sail University in Florida, and in 2006, landed himself an internship in New York with Ken ‘Duro’ Ifill, a mixer who has worked with everyone from Jay-Z to Usher. Swivel’s talents were eventually spotted by Beyoncé, and he worked on her albums I Am... World Tour (2010), 4 (2011) and Beyoncé (2013), earning a Grammy for his work on the singer’s ‘Love On Top’. Swivel also clocked up credits like Rihanna, Jay-Z, Jay Sean, Kanye West and many others, and seemed set to become a major studio player. However, after 2013 his chart-topping credits dried up, not to re-emerge again until his work with the Chainsmokers. So what happened? “Beyoncé is arguably the greatest artist of our generation, and I’m proud to have worked on a great body of work with her. But the intensity with which she works made it very difficult for me to maintain outside clients. After I had worked with her for a prolonged period of time, my other clients had found a replacement for me, because I had not been available. Also, she does not create in the way that for example Kanye does, who after he has done an album, even while touring, will continue working with other artists and recording things. When Beyoncé has done her record, she is gone. So there was a period after I stopped working with her at the end of 2012 during which I had to rebuild a lot of relationships that had sort of faded out. “Moreover, at that point I decided that I did not want to be just an engineer any more, instead I wanted to focus on mixing. So I spent a few years building up my mixing work, and turning down engineering gigs. Converting from being primarily an engineer to being primarily a mixer was a challenge. I had to work hard to become a great engineer and it took the same time and effort to become a great mixer. Also, in the beginning of 2015 I moved from New York to LA because there are more studios here, and there’s more work, and a more relaxed way of life. But I had to get to know people here. DJ duo the Chainsmokers have become hot artists in their own right. The vocal recordings of singer Halsey for the track ‘Closer’ were a good example of coaching an artist to deliver a better performance, as Swivel recalls. “Drew works in Ableton, and usually they come to me with a two-track bounce of something they are working on, which may have a demo vocal by Drew. We then talk about it, and when they have found a vocalist, I go into the studio and cut the vocals to their two-track bounce. I recorded Halsey’s vocals at Westlake Studios, in Production Suite 1, using a Telefunken ELA M251E, going into a Neve 1073 mic pre and a Tube Tech CL1-B compressor, which is a classic female vocal chain. I recorded some of Drew’s vocals there as well, by the way, using a Neumann U47 and the same outboard. But he had recorded most of his vocals already. Once the Chainsmokers judge that the vocal recordings and music for a song are complete, Taggart sends Swivel his entire Ableton session, exported as Wave files, which the Canadian then imports to Pro Tools. The screenshots for ‘Closer’ therefore show a large amount of stem tracks, indicating they are Taggart’s treatments of these tracks. In part because of this, there are very few plug-ins on the stem instrument tracks in Swivel’s mix session. The vocal tracks, by contrast, often have tons of processing. “Drew is trying things out all the time in Ableton Live and being dope and getting great sounds. For example, on the Chainsmokers’ web site there’s an online tutorial in which he explains how he got the guitar sound in ‘Don’t Let Me Down’. [Fender Telecaster DI into Apogee Duet, recorded into Ableton Live, treated with Native Instruments’ Guitar Rig plug-in set to the Arpeggio Delay preset, and the guitar then pitched up an octave.] It shows how hard he works on his productions. They are both very talented and do a lot of the polishing themselves, and when Drew sends me his stems, they are in pretty decent shape. “When Drew comes to me with a production that they feel is mostly done, in the first instance it’s my job to poke holes in it, and point out places where I think it can be better. If he agrees, he’ll go back to his Ableton session and he’ll make adjustments, and will export those and I’ll load those back in my session. There’s this expression, ‘We’ll fix it in the mix,’ and sometimes you can, but where possible I prefer to go back to the production session and tweak stuff in that. For example, in ‘Closer’ there was a bass track that I didn’t feel was really working, and we listened to it together and he agreed. So he redid the bass in Ableton, by removing all the attack on it. This softened the bass, and made it sit much better with the kick. This composite screenshot shows the full Pro Tools Edit window for DJ Swivel’s mix of ‘Closer’.DJ Swivel’s Pro Tools mix session of ‘Closer’ contains 82 tracks, starting at the top with 32 stem tracks. These comprise 14 drum audio tracks, a snare group track, and then music tracks including synths, guitar, strings, piano and saxophone — all samples and soft-synth sounds. The only track not marked ‘stem’ is the second one down, called ‘Bass Layer’ which is the replacement for Taggart’s original bass track. Below these drums and music stem tracks are a whopping 39 vocal tracks, which include four Drew Taggard lead vocal tracks, three Halsey lead tracks, two Halsey backing vocal tracks, four Halsey hook tracks, 12 Drew Taggart backing vocal tracks, and three ‘air’ vocal tracks sung by Swivel. 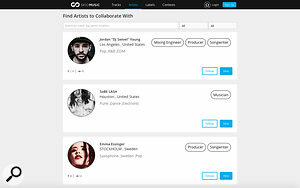 The vocal tracks are interspersed with several effect and group tracks. Below all these is a master track and 10 effect aux tracks, with four reverbs, three delays (medium, long and slap), a Waves Doubler track and two delay throw tracks. 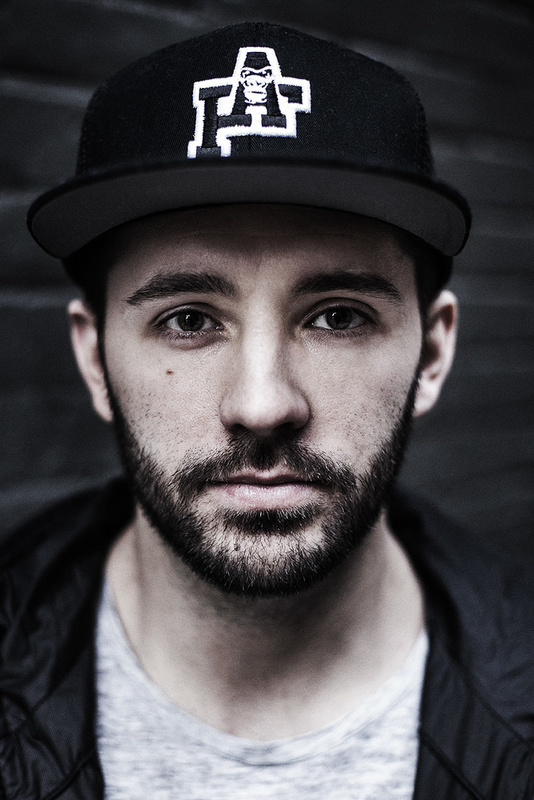 DJ Swivel: “I have a template that I start off with, which covers almost all my bases. When I am mixing, I don’t ever want to stop to set up buses or aux tracks. That’s just the most annoying part of a mix to me. I want to have everything up and running and ready to go. So at the bottom of the session I have these four reverb aux tracks, which I modify for every song. Usually they are a Lexicon hall, plate, and small room, and the fourth one is another Lexicon room, which comes from me using a Lexicon 960 when I was interning, and I also used it on Beyoncé’s albums. There is this interesting 960 preset called ‘Silica Beads’, which has a really long and sizzly tail with lots of high end and no low end, and that’s my fourth reverb. I like to put a little bit of that on a vocal sometimes to give it a little bit of shine and air. It livens the vocal up a little bit. Lexicon reverbs are the best for me. I love that stuff. But I don’t use all four reverbs on every song. In fact, most songs have just one or two. The delays below the reverbs are almost all from the Waves H-Delay, and the Doubler is there for width and stereo imaging. So that’s my template. “Once I have the final tracks and know we won’t be making any changes any more, I’ll go through the session track by track, and I usually go in order. I’ll start with the kick drum and make sure that the kick is punchy and hits. Then I’ll listen to the kick with everything else and make sure that the changes I’ve made to the kick translate well in the entire mix, and not just on the soloed kick drum. When I’ve done my before and after A/B, and am confident it sounds better, I move on to the next instrument, usually the snare, and I do the same thing. Then I go to the hi-hats and so on. Every time I’ll listen to each track in the context of the rest of the music to verify that what I have done is an improvement. After the drums I’ll add in the bass, and make sure it supports the drums, and everything else, and then I’ll go through the main instruments one by one. I do the vocals at the end, starting with the lead vocal, and once that sounds incredible, I’ll add the background vocals to support them. Drums: Waves SSL Channel, Maserati Drums; SPL Transient Designer; Lexicon PCM Native Reverbs. “Yes, there are very few plug-ins on the stem tracks, once again, because they were in such great shape! The kick stem has the Waves SSL Channel, which adds some compression and some low end at 60Hz. The Waves Maserati Drums is on the kick by accident. I just threw it on thinking, ‘Let’s see what it does.’ And it did something really cool by giving the kick some subby warmth, plus also adding some clickiness at the top to make it pop out. I just used a preset and modified that a bit. It turned it into a great-sounding kick. 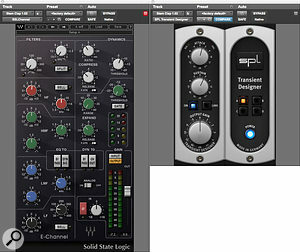 DJ Swivel’s mix processing chain for the snare stem made use of his favourite Waves SSL Channel plug-in, with additional snap added by the SPL Transient Designer.“The floor tom track also has the SSL Channel — just lifting it up a bit and making it pop — as do a clap track, one of the three snare tracks, and the ‘Open Hats’ track. Two of the snare tracks and the clap are sent to the snare bus. 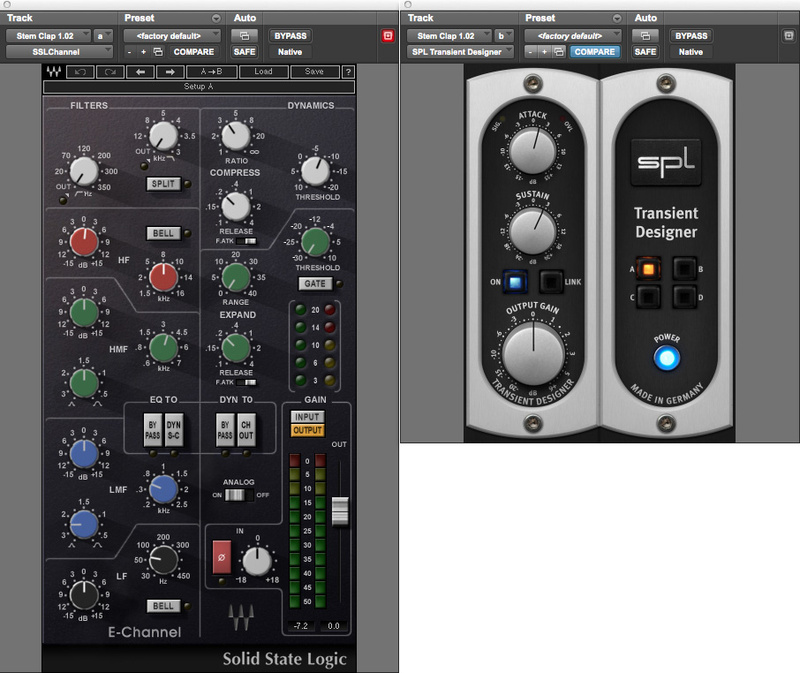 The clap has the SSL Channel and the SPL Transient Designer. The former adds some brightness, 1dB at 8kHz, and some compression, 4:1 ratio with a quick release. The Transient Designer added a little more attack to make the clap pop out, but also some sustain to make it last longer and feel bigger. Another clap track and one of the snare tracks are sent to the ‘B Reverb’ aux, which is the Lexicon large plate. Musical elements: Avid Channel Strip; SPL Vitalizer; Waves SSL Channel. Vocals: Waves SSL Channel, TrueVerb, Renaissance De-esser, H-Delay, Doubler, Renaissance Vox & Reverb, Kramer Master Tape; FabFilter Pro-Q 2; Lexicon PCM Native Reverbs; Valhalla Vintage Verb; Antares Auto-Tune; SPL Vitalizer. 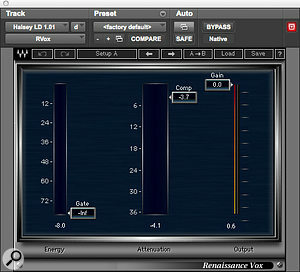 The greatest number of plug-ins were used on Halsey’s voice, which typically passed through two Waves Renaissance De-essers, a Waves SSL Channel and Renaissance Vox, and the SPL Vitalizer plug-in. “The first four vocal tracks are another example of Drew and I working together on the production. We decided that the last hook needed something to build it, so Drew sent me some vocal parts, which I chopped up and treated, again using the SSL Channel and also the Waves TrueVerb plug-in, and this resulted in these airy, spacey vocals you can hear at the end of the song that add a little extra lift. I used the TrueVerb, because the reverbs that I already had in the aux tracks at the bottom of the session didn’t give me what I wanted. “Below that are Drew’s lead vocals. He recorded most of them himself, using the Duet. I added the Waves RDeEssser, and a little bit of EQ from the FabFilter Pro-Q 2. The sends go to the ‘B Reverb’, which is the Lexicon plate, and the medium delay from the H-Delay and the Doubler. Drew’s hook vocals go to the Lexicon hall and medium delay. I also have the Throw delay on certain words. “Below Drew’s lead vocal tracks is a track called ‘Audio 1’, whose output goes to the ‘Rev Verb’ track below. I used that to create reverse reverb effects in three places in the song, each time leading into Drew’s hook vocal. Many engineers do this. I took the word ‘baby’ from the phrase ‘baby pull me closer’ and I dropped that on a new track, on which I have all the plug-ins I also have on Halsey’s vocals, plus the Lexicon hall reverb. I then reversed the word ‘baby’ and printed it with the reverb. I then reversed that again, meaning the word ‘baby’ is in the right direction, but the reverb is reversed, and you get this crescendo reverb just before the hook. It’s just a bit of ear candy. I think each one of them is slightly different. “All Halsey’s vocals apart from her hook vocals further down have tons of plug-ins and sends! The insert chain on these tracks is Auto-Tune, Waves Renaissance De-essser, Waves SSL Channel, Waves RVox, Waves RDe-esser and SPL Vitalizer, and on two tracks I add the Waves RVerb, and on the ‘Delay Chop’, which happens just one moment towards the end, the Valhalla Vintage Verb. Each of Halsey’s vocals here is EQ’ed slightly differently, and also the same with the de-essers. 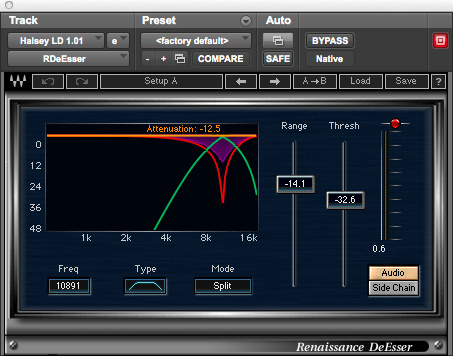 The first in the chain usually works as a normal de-esser, and the second functions more as corrective EQ. They each have different frequencies that they act on, with different thresholds and amounts, and they tend to correct small issues in just one word or so. It may be a harsh upper-mid thing, which female vocals can have, and I just carve out those frequencies with the RDe-esser. I don’t want to take it out of the entire performance, because that frequency may add energy to the overall vocals. “I also like using the RVox as a second compressor, to really tame the vocal. It just brings it right out in front and sticks the vocal in your face. I usually am pretty subtle with the RVox, but every once and a while I’ll slam it and you get this really cool sound. I learned that from Pensado’s Place. Finally, the SPL Vitalizer again adds some sheen to these vocals. The ‘Halsey Delay’ track adds four delays at the end of the song, with the second one pitched down with Auto-Tune. You can get some cool things by pitching down the vocals in Auto-Tune and changing the throat length and things like that. “In addition, all these tracks have tons of sends, going to the Lexicon plate reverb, in some cases the Lexicon hall reverb as well, and the H-Delay medium delay and the Doubler for more width. The ‘Halsey Lead 1’ track also has a send to the ‘Tape Delay’ track, on which I have a delay from the Waves Kramer Master Tape plug-in, which is set to a 15ips slap with not a lot of feedback. That delay adds a nice tonality and space. I also have several delay throws on certain words she sings, like in her opening line, where it goes ‘you... you’ on the upbeat. “By comparison, there are very few treatments on Halsey’s hook vocals, which only have Auto-Tune, the SSL Channel, and the Doubler. 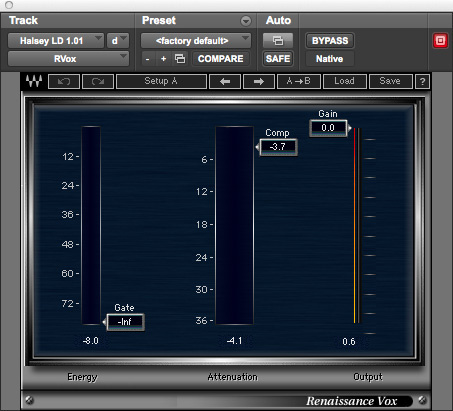 Similarly, Drew’s backing vocals also have these plug-ins, and some Lexicon plate reverb. I’m using the SSL Channel to get rid of some high end on some of the tracks, because they were a little too bright, and had different effects on each of them to make sure they were not too similar. “Finally, there are three ‘air’ tracks, which are yours truly on backing vocals! While mixing I felt that the song needed more air in the background in a number of places, and so I sang this falsetto vocal three times, put Auto-Tune on, the RDe-esser, the SSL Channel, the Doubler, and in once case the Lexicon plate reverb, and the SPL Vitalizer and hall reverb in the other two. The first one sits in the middle and the other two are panned hard left and right around it. Stereo Mix: Slate Digital VMR. 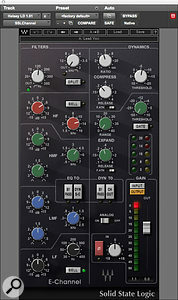 “I’m using the Virtual Mix Rack plug-in from Stephen Slate on the master bus. I love that, and it’s just adding some thickness. It gives the entire song a little bit more warmth in the bottom end. I did something on this song, and on ‘Don’t Let Me Down’ as well, which I have never done before, which was to have sections in the volume automation where I push the entire mix in the drops up half a decibel. We wanted the drops to hit a little harder, and that was a subtle but effective way to add extra punch and impact. 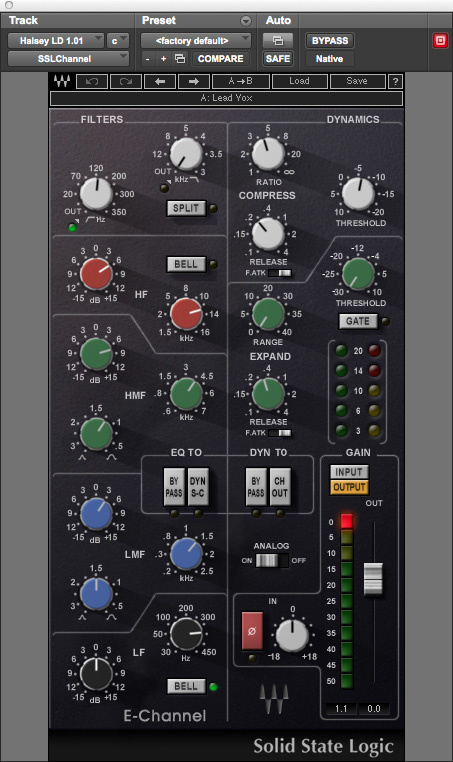 “I also have the Waves SSL compressor and L2 on that master track, but they are deactivated. When I send mixes out for approval, I will send it with a basic SSL compressor on it, to tighten up the overall mix, nothing crazy, and then the L2 to bring it up to a nice loud volume. But I don’t like to master songs. I work with the best mastering engineers in the world, and Chris Derringer at Sterling Sound mastered this song. He’s amazing, and does a better job than me. I make sure I give mastering engineers a clean mix with enough headroom and no limiting or compression, so they have lots of space to work with, and I then let them do what they do. I work closely with Chris, and we always get great results. For anyone to whom this sounds a bit like double-dutch, DJ Swivel explains that it is, in fact, pretty simple. “In 2015 I visited Vancouver and was introduced to this business that was just in the process of being set up. I ended up working with them and became one of the co-founders. 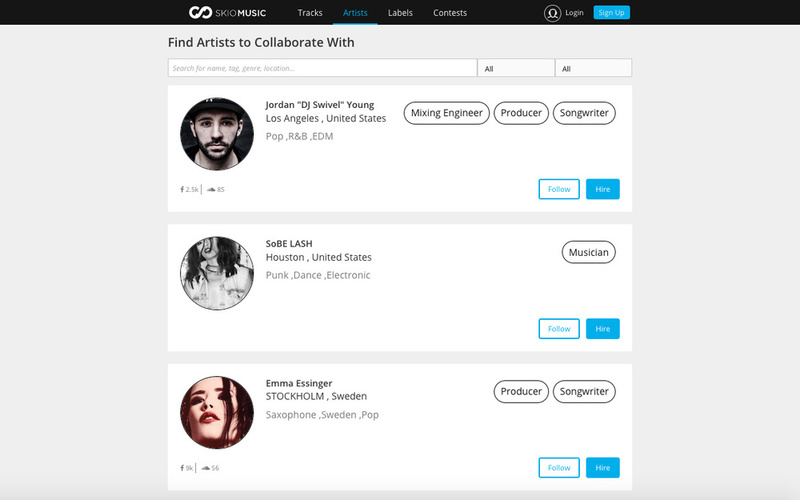 What we’ve created with SKIO is a marketplace for anyone, remixers, DJ’s, beat makers, artists, to be able to find and legally use another artist’s original stems or samples. “Young people make music very differently today than they did 10-15 years ago. Anyone can buy a laptop and download Ableton Live and tons of plug-ins and make great-sounding stuff. People are creating music in such a fluent way now, and they find a song or a sample and do a remix of it, or chop it up, and they don’t really think about copyright issues. But YouTube and SoundCloud have content ID algorithms that will flag any copyrighted content and will remove it, even for music people offer for free. Adapting to the realities of 2016, DJ Swivel does almost all his mixing work from home in the ultimate 21st Century studio, consisting of just a laptop, DAW and monitors. “I do still mix in studios, sometimes, and I have friends who own studios, and I will occasionally use theirs, but honestly, I can mix anything in the room I am in right now. I mixed all the Chainsmokers songs here. I really enjoy the convenience of working from home. Yesterday I finished four songs, and I would not have been able to do that in a studio. I woke up, did an edit before breakfast, another edit after breakfast, and so on. I’m very productive in my own home. "I have Genelec 8351a monitors, which are just brilliant pieces of gear because I can tune them to the room I’m in, using their SAM technology. I put the mic that comes with it where my head would be, run the software and calibrate my speakers for frequency, volume and time delay, and I get this incredibly flat response out of them. It’s just super-helpful, especially in an apartment room like this, which doesn’t have any acoustic treatment. Plus I have these great Sennheiser HD650 headphones, which I know inside out. I’ve mixed on airplanes with them! Between the Genelecs and the headphones, I get rock-solid mixes.